How often have you used a vacation day for something other than an actual vacation? Doctor’s appointments, family emergencies, spring cleaning at home, and more tedious tasks have taken the place of many American’s paid vacation days. The issue became so apparent that the U.S. Travel Association began Project: Time Off, which encourages people to make the most of their vacation days. The last Tuesday of January is officially National Plan for Vacation Day, and Maryland is fully on-board to participate in the much-needed cause. More than half of Marylanders have unused vacation days totaling almost $16 million left on the table at the end of the year. This nearly $2 billion in untapped economic benefit can be remedied on Tuesday, January 29 using the guide below to #PlanForVacation. Much of Maryland can be explored for free or at a very low cost. So carve out your travel time guilt-free! Assateague Island National Seashore – Less than 10 miles from Ocean City near the charming town of Berlin, the shores of Assateague Island allow you to enjoy a quieter beach alongside wild horses. Call 877-444-6777 for camping reservations and permit options. Mallows Bay – Explore the largest ship graveyard on the East Coast, the Ghost Fleet of Mallows Bay, off the Potomac River in Charles County. Kayaking among wrecked World War I era ships is sure to leave a lasting memory of your summer adventures. Washington County Museum of Fine Arts – Drive Maryland’s scenic byways to mountainous Washington County to explore more than 7,000 works at this historic museum of fine arts. Established in 1931, the museum is considered one of the finest of its kind in the United States and boasts stunning neo-Georgian architecture. The Awakening at National Harbor – It is easy to spend days at National Harbor with everything the area has to offer from entertainment to fine dining. But if you’re going to travel to the D.C. area, you must see the sleeping giant statue titled The Awakening. The 15-foot high, multi-piece sculpture bursts from the sands of National Harbor’s beach and is not to be missed. Maryland is home to nearly 8,000 miles of shoreline, meaning there’s more sun and sand to find than you may realize this vacation season. North Beach & Chesapeake Beach – These twin beaches are connected by summer shuttles, and they’re just an hour away from Washington, D.C. in Calvert County. The Town of North Beach is ideal for holding family-friendly events for all to enjoy and Chesapeake Beach is home to the luxurious Chesapeake Beach Resort & Spa. What more could you want than a short drive with a destination that has something for everyone? Cunningham Falls State Park – Located in Frederick County’s Catoctin Mountains, Cunningham Falls is a designated swimming area at Hunting Creek Lake that is perfect for waterside picnics and camping. The 78-foot waterfall is the largest waterfall in Maryland. Rocky Point & Hart-Miller Island – Home to the Rocky Point Golf Course, this Baltimore County gem offers beach camping and boating for those who want to get off the beaten path. Call 443-481-9976 for more information. 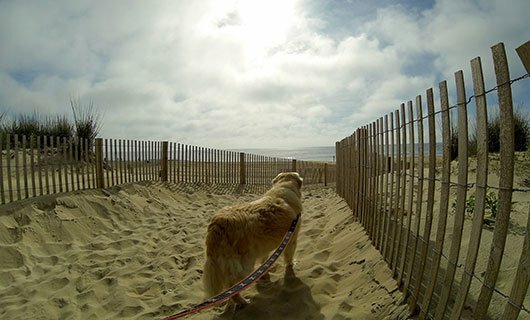 Ocean City – This may seem like an obvious vacation spot, but there’s a reason Ocean City is a longtime summer tradition for Marylanders. Amusement parks, a smorgasbord of dining options, thriving nightlife, mini-golf, and of course a vast expanse of beach stretching up to the Delaware line means there’s a million reasons to schedule your O.C. trip A.S.A.P. Whether it’s sports on the water, in a stadium, or in the sky, Maryland has a lot to offer the competitive and active traveler. 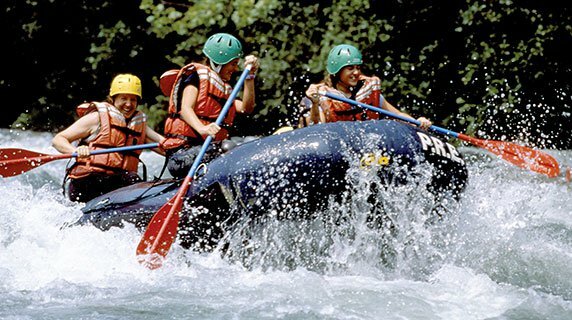 Whitewater Rafting – Adventure Sports Center International in McHenry is the place to master your whitewater craft. Featuring the world’s only adjustable whitewater course, from classes I through IV, this 1/3-mile whitewater rafting course will thrill beginners and experts alike. This is the perfect way to prepare yourself for the natural rapids of Western Maryland. Oriole Park at Camden Yards – Travel to the city to experience one of the best ballpark’s in the country. Oriole Park at Camden Yards is the perfect place to enjoy a baseball game while sipping on a local brew and indulging in crabby cuisine. Extend your stay with a night at the Hilton Baltimore, which features rooms with views of the ballfield! Sail on a Skipjack – Learn how to command the official Maryland state boat. Built in 1955, the H.M. Krentz offers sailing charters from the Chesapeake Bay Maritime Museum in St. Michaels from April to October. Make a day of it by touring the museum and staying in the charming town it resides in. Sky Diving – There’s no way you can miss the iFLY Baltimore tower off of i-95 in White Marsh. The company utilizes the same technology used to train army paratroopers and Navy SEALS for guests to experience free-fall at a fraction of the cost of traditional sky diving. For those seeking the real deal, enjoy the adrenaline rushes offered in Churchville and Ocean City. Maryland has a lot to offer the luxury traveler that’s seeking unique experiences this vacation season. If you’re ready to splurge on one of these options, be sure to book well in advance to guarantee your spot! The Ivy Hotel – This award-winning boutique hotel located in the historic Mount Vernon neighborhood of Baltimore City offers one-of-a-kind services, amenities, and ambiance. The Ivy boasts 18 rooms, each with a fireplace, and is home to the fine-dining bistro, Magdalena. Helicopter Tours – Get a view of Maryland like you’ve never had before with Monumental Helicopters and Charm City Helicopters. Experience the skyline of Baltimore, the rolling hills of Western Maryland, or the shoreline of the Chesapeake from 1500 feet up. Charm City Helicopters also offers a VIP package featuring a dinner and hotel stay. Yacht Charters – Watermark offers luxury yacht charters on the Chesapeake Bay featuring premiere chefs and a full boat crew. Sit back and relax while you and your company enjoy Maryland’s most treasured natural resource. Sagamore Pendry Hotel – Take a step back in time at the stunning Sagamore Pendry Hotel located on Recreation Pier in Baltimore City. This extensively renovated 1914 property has earned praise from Conde Nast Traveler and others for its stunning aesthetic, amenities, and fine-dining. Sip on a locally distilled Sagamore Rye Whiskey and take in the idyllic setting of Fells Point. For more information about Plan for Vacation Day visit www.visitmaryland.org/list/plan-your-vacation.